Gorgeous George Needs a New Home! 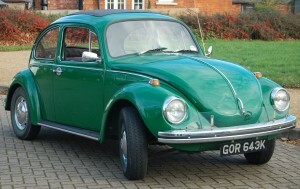 This is Gorgeous George – my beloved 1972 Beetle (not the talented, recently married actor, Mr Clooney!). The time has come to find George a new home, as having moved house I have nowhere for George to live in comfort and to the standard he has come to expect. So with heavy heart he’s up for adoption (sale). As you may have worked out George is no run of the mill man – he is a fabulous rare oak green 1972 1302s Beetle who has been part of the Retro Bazaar family for 5 years now. George – or to give him his full name – Georgimus Maximus Decimus Meridius – is the ripe old age of 43 and as such has a few bumps and bruises. However in 2011 he had a full restoration. He was stripped down, and loads of bodywork issues were attended to. He got 4 new wings, and lots of welding underneath, suspension bits, and a total respray in Oak Green, which is his original factory colour. Being a 1302s George is quite a rare model of beetle, only made for a short while before the “Super Beetle” came out. This means George has a flat windscreen, and still looks like a traditional Beetle, but underneath has more modern suspension, disk brakes at the front and a 1600cc engine which means a little more oomph in today’s traffic. Through all his restoration George has been left as original as possible, the only additions are an electronic ignition on the engine to aid reliability and a 1970s Radio/Tape player which has been modified for MP3 so you can plug in your phone for music. Unfortunately I have not had the time to lavish the time and attention George deserves, and recently he has been a bit neglected. He is a good solid car, with a full MOT, but his paint has started bubbling in a couple of small places, and he looks like he really could do with a hug.